This image of a circular depression on the surface of Mars was acquired on Jan. 5, 2015 by the High Resolution Imaging Science Experiment (HiRISE) camera on NASA's Mars Reconnaissance Orbiter (MRO). The spacecraft has been orbiting Mars since March 2006 and completed its 40,000th orbit around Mars on Feb. 7, 2015. The target of this observation is a circular depression in a dark-toned unit associated with a field of cones to the northeast. At the scale of an image taken by MRO's Context Camera, which provides wide area views to provide context for high-resolution analysis, the depression appears to expose layers especially on the sides or walls, which are overlain by dark sands presumably associated with the dark-toned unit. 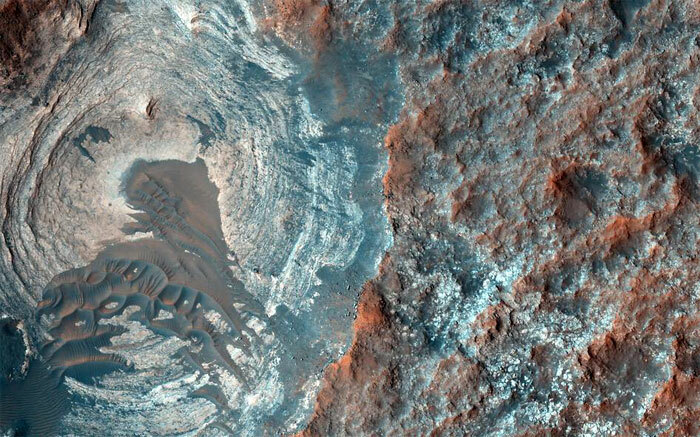 The HiRISE camera's resolution, which is far higher than that of the Context Camera and its larger footprint, can help identify possible layers. HiRISE is one of six instruments on the Mars Reconnaissance Orbiter. The University of Arizona, Tucson, operates HiRISE, which was built by Ball Aerospace & Technologies Corp., Boulder, Colo. NASA's Jet Propulsion Laboratory, a division of the California Institute of Technology in Pasadena, manages the Mars Reconnaissance Orbiter Project for NASA's Science Mission Directorate, Washington.